He was going to die. Lying on the dark roadside, his long hand splayed over the oozing hole in his side, Thomas Moreland felt the life draining from his young body. He lamented the loss of his future more than he dwelled on the searing in his side or the nearly unbearable pain that spiked through him at any futile attempt to move his legs. He would never cross the seas to make his fortune. His youth had been misspent on his obsessive pursuit of saving money for the passage to India. It sickened him to remember all the years he had shoveled horse dung and denied himself visits to the ale house and the courting of ladies. All for naught. For his every farthing now lined the pockets of a pair of knife-wielding highwaymen. Only a green fool such as he would have ventured this road at night. Tomorrow horses would once more carry travelers along its dusty path. A verdant landscape would replace tonight's eerie clumps of silvery trees. And he would be dead. The unexpected rattle of a carriage on the lonely country road stunned him. If only he could get the driver's attention. It was no easy task for a man whose legs were now incapable of movement. Lying on his belly, he began to move forward, propelled by his powerful arms. His pain was so great, he hoped he did not lose consciousness. The carriage slowed, and Felicity Pembroke peered out her window to see what the problem was. Under the moon's glow she saw a young man crawling into the lane, a trail of dark liquid on the dirt showing his progress. "The man's been hurt!" she cried, demanding that the coachman stop. "Oh, my lady, you mustn't!" her abigail shrieked. "It's all a ploy to get yer diamonds." "Look for yourself, Lettie," Felicity said. "The man is seriously injured." The maid peeped a glance out the window. "It's a trap." "Papa saw to it that we are well guarded." The equipage came to a stop, and the coachman, armed with a rifle, stepped down and opened the carriage door. "Go aid that poor man," Felicity snapped at the coachman. Aiming his rifle at the injured man, the coachman gingerly walked up to him. "What ails ye?" "I've been robbed and stabbed," the young man croaked, nodding toward the lower part of his body, "and I think my legs broke when I was pushed from my horse." Still gripping his weapon, the coachman lowered it. "Got yer horse too?" "Yes, and it'll fetch a hundred guineas for the damned blackguards." John dropped his aim and called back to the coach. "Come give me a hand, Jeremiah." The two men carried the wounded man to the carriage where Felicity instructed them to put him inside. "But he's bleeding like a sieve," Lettie objected. "And caked with dirt," the coachman added. Felicity's voice was impatient. "We'll put him on the rug." The servants lifted the large man. Even in a painfully seated position, his legs were too long to stretch across the seat Lettie had vacated, and he was unable to bend them. "I think the kneecap's shattered," he muttered. All Felicity could see was the blood gushing from his side. The poor man was going to bleed to death while they worried about where to put his useless legs. "Have we something to bind the man with?" she asked frantically. She sighed. "If you gentlemen will turn your heads, I will remove my petticoat to use for a bandage." "Oh, my lady!" Lettie shrieked. "Ye can't go and do that." Felicity whirled at her. "And why can't I?" "My dear Lettie, this man may bleed to death if we don't help him." The abigail's remorseful gaze dropped to her lap. The next sound heard was the tearing of Felicity's petticoat into strips with which to bind the wounded man. The pain from bending his knees to fit him to the carriage seat must have caused him to black out. When Thomas awoke, he experienced a numbing sense of comfort, of sweet feminine smells and warmth like his mother's bed when she nursed him through the croup. He opened his lids and beheld the most beautiful face he had ever seen. She needed only a halo atop her golden ringlets to look like an angel. She smiled when his eyes opened, causing deep dimples to crease her squared cheeks. Her creamy skin was flawless, as were her perfect white teeth. Her great blue eyes sparkled when he spoke. "May I know your name?" he asked her in a hoarse whisper. "I am Lady Felicity Pembroke." "Soon to be Mrs. Harrison," Lettie interjected. "She's to wed Captain Michael Harrison next week." A most fortunate man, Thomas thought. "Can you hold on for the hour it will take to get to London and my very excellent physician there?" Felicity asked in a soothing, melodious voice. He nodded and fell back into the hard side of the carriage. He was going to live after all. "I daresay I could become foxed from breathing the air in your chamber, George," Felicity scolded her sleeping brother. The young man being addressed–George Pembroke, the Viscount Sedgewick–rolled over in his bed and pried open a single green eye to gaze at his elder sister. He squinted against the bright sunlight filling the room from the tall casements. "What ungodly hour is it?" "It's well past noon and time you got up. We must talk." "But I didn't get to bed--"
"I know very well what time you got to bed for it was precisely at the same time I was rising." Felicity held out a cup of strong coffee. "Drink this." He sighed heavily as he rose to a sitting position, ran a hand through his tussled golden hair, took the delicate porcelain cup and saucer and proceeded to drink the steaming brew, wincing. "You could at least have sweetened it." She drew up a chair and sat down to face him. She hated having to berate her brother, for he was only indulging in the same pursuits enjoyed by the other young bucks of his acquaintance. But the other bucks did not have a father who had departed this world leaving his offspring with more debts than his estate could rectify. George's gaze fixed on a packet of papers she held. They looked like tradesmen's bills. "It was all I could do not to embarrass you last night when you were deep in play at the Assembly Rooms," she chided. "You promised no more gaming, and I have it on good authority you played all through the night." He gave her a cocky look. "What makes you think I lost?" "Are you telling me you won for once?" "Just as I thought. You're exactly like Papa. Because of his losses at the gaming table, another family now inhabits Hornsby Manor, which should be yours." "I'll get it back, just you wait and see. My luck will turn." He was far too optimistic for his own good, Felicity thought. "How many times do I have to tell you, economy, not Lady Luck, will get Hornsby Manor back? I thought when I got you out of London and we came to Bath, you would quit your lavish ways, but you've run up enormous bills with tailors and livery stables." She flung the bills at him. "An advantage to making your home in Bath is that you don't have to keep your expensive mounts. We can walk everywhere we need to go." He looked remorseful. "I'll sell my bay tomorrow." "Today!" she snapped. Though she was only a year older than George's three and twenty years, she had always treated him as one treats a child. He took another sip of coffee. "Very well." She could never suggest to him the one thing he needed to steady his ways–a wife–for he had yet to become enamored of decent young ladies. She frowned at the distasteful thought of the doxies George and his chums associated with. "We'll never find a suitable match for Glee as long as her brother is unable to dower her. If you don't mind that you've dragged the family name through mud, can't you at least care about your younger sister's future?" He frowned. "I do care. Was trying to make things right last night when my luck failed me. And I don't see why I alone have the responsibility for Glee's future happiness. If you'd only marry the colonel, we'd have enough--"
"I could never marry the colonel," she protested, "no matter how good he's been to me–to us." Her eyes ran over the black gown she wore. Michael had been dead four years now and still she wore widow's black. "I can never marry again. No man can ever take Michael's place." George sat up straight and spoke softly. "It grieves me that you still mourn Harrison so keenly. You've got to allow yourself to live again, Felicity." A wistful smile crossed her face. "I don't have to be married to live, you goose. Do I have to remind you I have become quite the grand dame of Bath society? And I mean to see you and Glee properly married." He winced at the mention of his own unwelcome nuptials. A knock sounded on the door, and the butler announced that Mrs. Carlotta Ennis was below stairs, calling on Mrs. Harrison. "I'll be right down," Felicity said. Though the two women were quite different, Felicity and Carlotta had become friends while both were married to Guards officers in the Peninsula. They were of the same age, both of privileged backgrounds, both beautiful, and both had been widowed at a very young age. While Felicity grieved that she and her captain had not been able to conceive, Carlotta regretted the son she had borne and did her best to avoid. The raven haired Carlotta, wearing a lavender morning dress, rose and took her friend's hand when Felicity glided into the room, greeting her friend with dimpled smiles and cordial words. The two sat next to one another on a damask sofa. "I came straight away to tell you the newest ondit," Carlotta said smugly. "My maid's sister has just been employed at Winston Hall. It seems a fabulously wealthy nabob has purchased the estate and takes possession this very day." "I hardly see why this is of great interest to me," Felicity said. Carlotta's large lavender-gray eyes shone with mirth. "The nabob is a bachelor." "I am sure he would be much too old for Glee. Remember, she is but seventeen." "It wasn't your sister I was thinking of," Carlotta quipped. "What about you or me?" Felicity glanced at her own black dress. "You know I intend to stay Mrs. Harrison until I die." Carlotta rolled her eyes. "Oh, yes, Michael's martyr. I, for one, mean to remarry. And I certainly would not object to marrying a man of wealth." "But what of rank? What if the nabob's from a family of low birth?" "With his money, he'll be accepted." Felicity frowned. "Edward, though he had no title and no money, was of good birth. Surely you owe it to his memory and to your son to avoid a misalliance." "Pooh!" Carlotta said. "I allowed my first marriage for love. My second will be for fortune. It grows tedious getting by on Edward's meager pension." Felicity frowned. "I cannot help but feel pity for poor Lady Catherine. 'Twas bad enough losing her home--"
Stanton knocked on the drawing room door and announced that Colonel Gordon was calling. On Felicity's instruction, the butler showed the man into the room. Though his hair was graying, Colonel Gordon's lean frame of well toned muscles gave little evidence of his thirty-nine years. Because of his family's wealth, he had become a colonel by the time he was five and twenty. His face was handsome, and his tailoring impeccable. Leaning on a silver headed walking stick, he limped into the room, the bad leg a testament to his shortened duty in the Peninsula. "How good it is to behold the two most beautiful ladies in Bath," he greeted, bowing to them before stiffly lowering himself into a chair facing them. "I've just been telling Felicity about the nabob who's bought Winston Hall." "So I've heard," he said drolly. "It's all over Bath. Perhaps we will see him at the Pump Room today. That is, if you ladies will do me the goodness of accompanying me." "You and Carlotta go on," Felicity said. "George and I have matters which demand our attention today. And I scarcely need drink the odious water for I enjoy excellent health." Carlotta cast a furtive glance at Felicity. "Don't be too hard on the boy." Felicity pursed her lips and glared mischievously at Carlotta. "And don't always take up for George. One would think you were his sister." Carlotta and the colonel rose, Carlotta taking his proffered arm. 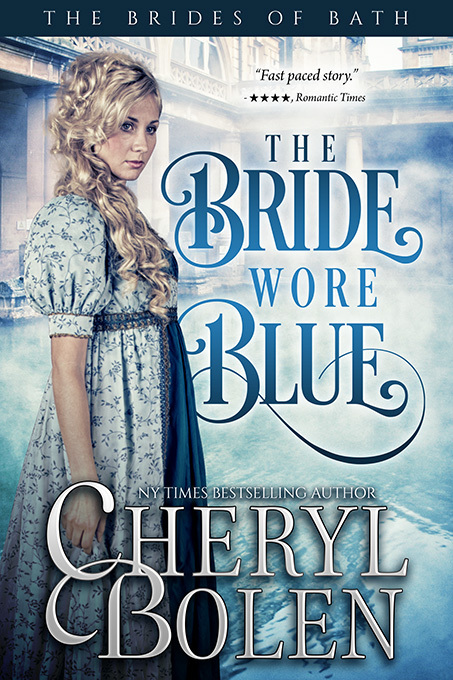 "But my dear," Carlotta said to Felicity, "nary a drop of blue blood runs in my veins." Felicity watched as they left the room. A pity the colonel fancied himself in love with her, for he and Carlotta would have suited one another. Many a time Carlotta had lamented that the handsome colonel was wasting the best years of his life on Felicity. Thomas Moreland settled his large frame against the soft leather chair and ran his eyes over the tall wooden cases filled with leather-bound books. It was all his. All of Winston Hall was now his. A year shy of his thirtieth birthday, and he had amassed more riches than he'd ever dreamed of back in the days when he cleaned horse stalls for two shillings a week. From his pocket he withdrew the torn white linen he had carried from one end of India to the other. He had washed his blood from it and dried it in the sun six long years ago. It was a piece of his rescuing angel's petticoat. Felicity Harrison's. Next, he read the runner's report and the letter from the solicitor he had paid an exorbitant sum to glean other information. Now, it was his turn to rescue Felicity Harrison.